What are the necessary conditions for the success of one symbol of a collective identity, though? This symbol should both carry an ancient spirit and a contemporary soul. It should be an indispensable part of workdays, as well as of festivities. It should be a part of the collective unconscious and the national idea. It should be the border between us and the rest, yet giving room for regional and local variations. It should be living, not a museum exhibit. Its materiality should be as dear to our hearts as is its immateriality (read spirituality). The scrumptious Bulgarian banitsa, older than the coat of arms, the anthem, and the nation, and yet younger than ever before, abides by all these conditions. There is hardly a person who would be able to disprove the claim that the Bulgarian cuisine is one of the most wide-ranging and richest worldwide. It unites numerous rich soups and hearty salads with countless meat dishes and pastries. However, only mentioning the phrase “traditional Bulgarian dish” immediately makes all locals paint an image of one specific food in their heads – a homemade banitsa – and start dripping saliva. Prepared with layers of dough sheets with different stuffing, it was an indispensable part of every Bulgarian festive meal in the past. In our time, nevertheless, it has gradually lost touch with festivities and has turned into a daily food for everybody and is also one of the symbols of the Bulgarian national cuisine. Wandering through the recipes of traditional Bulgarian cuisine, you will stumble upon innumerable, and very diverse, recipes for banitsa. For instance, depending on the whether the filos (unleavened dough) are kneaded or pulled, banitsa would be kneaded or pulled, respectively. In terms of the taste, it could be either sweet or salty, and in accordance with the layers, it could be one layer over another or in a spiral form. All the layers are made of flour dough and then the banitsa is baked in an oven. 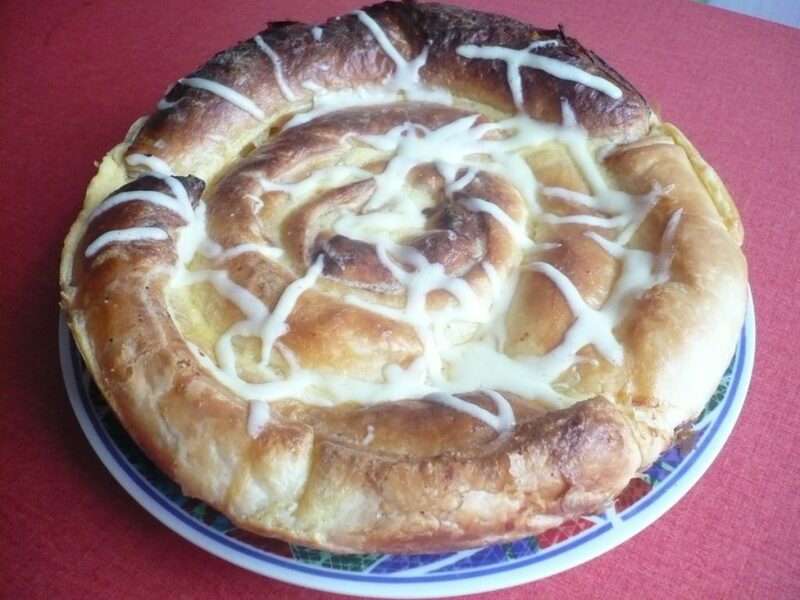 This is a spiral banitsa sprinkled with kashkaval (yellow cheese). Photo courtesy of Denitsa from Itinerariumvitae. When it comes to the filling, one can really put his or her imagination in “innovation” mode and create that scrumptious pastry. 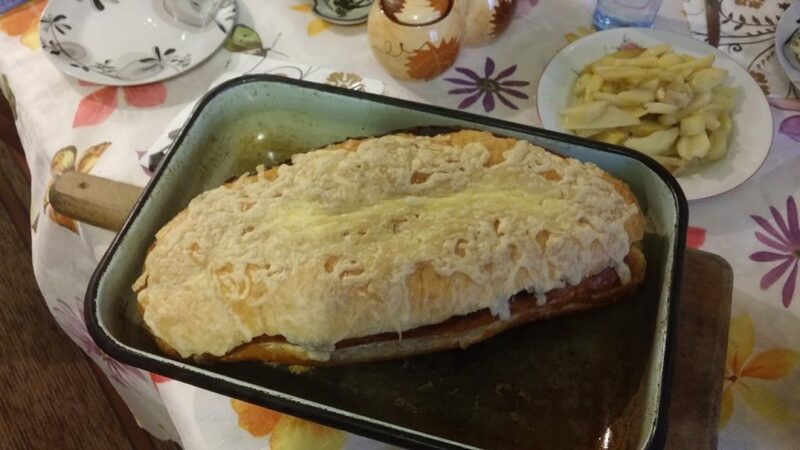 Banitsa can be prepared with pumpkin (called “tikvenik”), with cabbage (“zelnik”), with onions (“louchnik”), with rice, spinach, leeks, meat, potatoes (“patatnik”), and many others. There are other options, such as “къпана баница“, which literally means “bathed banitsa”. After baking your banitsa, you need to put some milk and eggs on top, and bake it for a couple of more minutes. 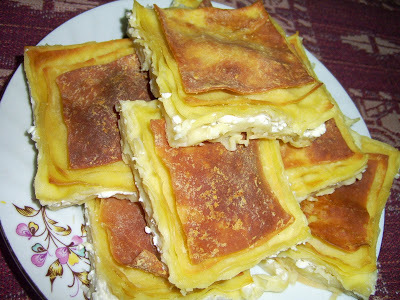 However, if you want to be a true classic, the most famous banitsa variety is that with cheese and eggs filling. It has really become one of Bulgaria’s national symbols and it is a favourite breakfast or snack for generations of Bulgarians. Typically, it is accompanied by yoghurt, boza (a traditional Bulgarian drink that has a bitter-sweet taste and a very low alcoholic percentage – 0,1%), or ayran. Now, let’s get to some recipes. We’ll start with a classic one. Put some grease in a large baking dish. Layer each of the individual filo sheets one by one by putting tiny amounts of the filling (whisked eggs and Bulgarian, white brined cheese – sirene) and sprinkling sunflower oil or/and melted butter between each layer. This is done until you run out of sheets. Usually, you put some of the filling on top and then bake at 200-250 °C (400-480 °F). The second you get the banitsa out, drizzle some water on top and cover with a big towel. Alternatively, you can fill in each layer and then roll it into a tight roll. Make sure the filling is inside the roll. Place the first roll in a circle in the centre of the baking dish and repeat with the rest, putting them around the first one. The shape is similar to a spiral. Again, sprinkle with melted butter and/or sunflower oil and bake. 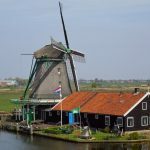 Of course, it goes without saying that the most delectable banitsa is born when everything – from the dough through the eggs to the cheese – is home-made. Some prepare it with cottage cheese, too. You can improvise and prepare it with different kinds of meat (bacon, lard, ham, sausages, etc. ), but the traditional banitsa is vegetarian. However, to make it vegan, there are literally multitudes of options which vary from minced soy through potatoes, cabbage, mushrooms, nettle, spinach, leek, olives, roasted or fresh peppers, and green spices. Don’t forget to put some (cold-pressed) oil, olive oil, or even coconut butter/oil. And to make it really healthy, the dough can be prepared with einkorn or any other whole-wheat flour. Bon appétit! This is a calzone banitsa from my friends from The Magic of Traveling. 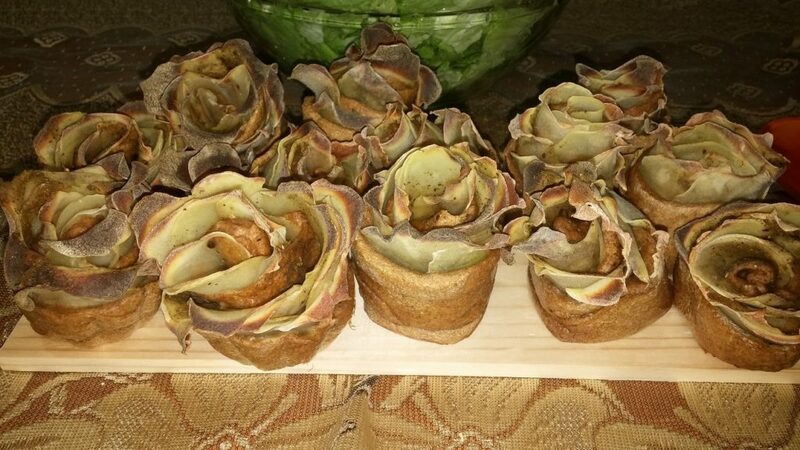 The following three images are gorgeous banitsa-roses made of einkorn and potatoes. Next to them is a jar of lyutenitsa. Read more about it here. Close shot of the roses. 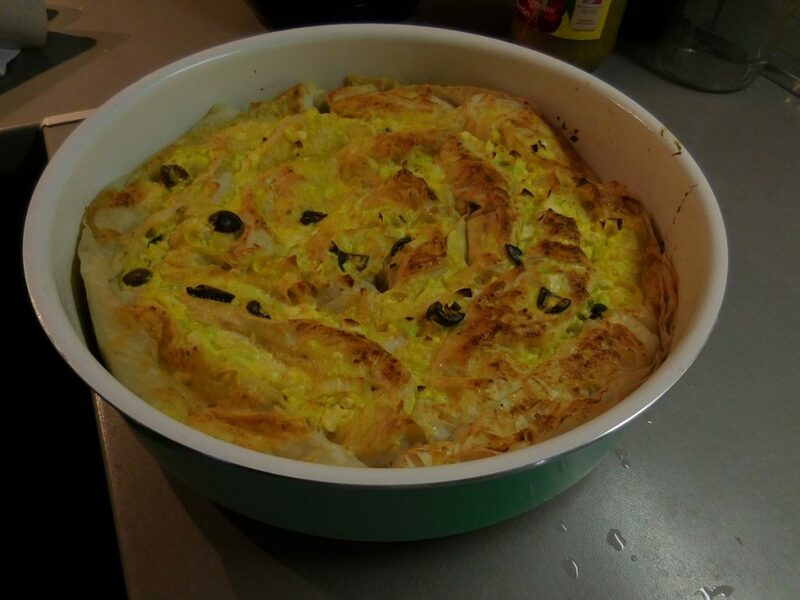 And to conclude, here’s my variation of a banitsa with cottage cheese, olives, leeks, and whole-wheat dough. On New Year’s Eve (and sometimes for Christmas), most Bulgarian women will prepare a special festive banitsa in which they would hide lucky charms. The charms vary from coins (symbol of prosperity and money) to tiny symbolic objects (for instance, a small piece of dogwood branch which has a bud – a symbol of longevity and health). In recent years, people have begun writing wishes for joy, happiness, and luck on small paper pieces. Then, they wrap them in tin foil (to preserve them during baking) and put them inside the banitsa. One could say that these are quite similar to fortune cookies. When the charms have been hidden inside the pastry, it is then baked and cut into pieces matching the number of family members, as well as one piece which is especially for the house. Every piece has a dogwood branch inside of it. Wishes are related to each branch and the branch’s different number of buds aids in recognising the matching wish. “Health”, “love”, “travel”, “success”, “joy”, “marriage”, “wealth”, and “happiness” are some of the most common fortunes. The pastry is then spun on the festive table and each of the family members gets the piece that is in front of him/her when the spinning has stopped. After that, everyone discovers their lucky charms – the fortunes inside envisage what the bearers should expect in the upcoming year. 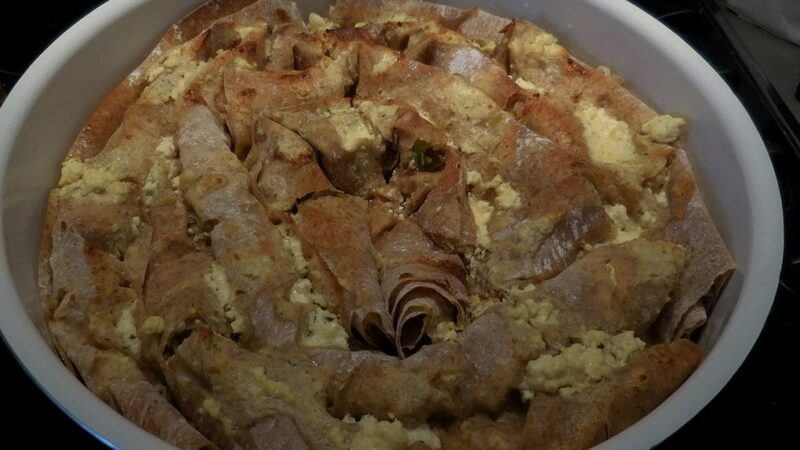 Have you drooled over banitsa before? What is your favourite recipe? Yumm! These look delish! I would love to try a savoury one, perhaps the traditional one with eggs and cheese. There are so many different kinds to choose from. It is really one of the best meals you have not yet tried :)) And the traditional one is the real classic! If we add some leeks to it, it is just divine! 🙂 Thanks for reading and wish you can try banitsa soon! Hey, Danni, thanks very much for your comment! Definitely include a message in the big pieces and read (and eat) them with pleasure! Banitsa is simply scrumptious! This is my kind of post. I did love Bulgarian food when I was there, but I’m not sure I tried a banitsa. Darn, I’ll have to go back! Thanks very much, Corinne! I am sure you have not tried it as you will very well remember it – especially the homemade one! 🙂 Come back to try it! This looks delicious! A while ago my plan if I couldn’t find a job was to move to Bulgaria and stay with my friend’s grandmother until I could speak Bulgarian and knew how to cook. It’s too bad I found a job! I’m finally going to Bulgaria for the first time in a few weeks, so I have a serious food mission now. Banitsa is really delicious, Cori! Haha, what an interesting plan, I would have to say! If you are coming soon, I can guide you around Sofia should you need any help! But beware because it’s freezing these days! Thanks for reading! This looks so good. I’m a vegetarian so love the fact that its a veggie dish. I’ll have to try and make this sometime. Not sure i’ll be able to get that cheese though! Yes, it does remind a bit of fortune cookies (funny thing about them is that they are an American – San Francisco – creation, not Chinese). I always look forward to reading my fortune! Thanks for reading! Banitsa looks scrumptious. I never even heard about Bulgarian cuisine or its rising popularity so this was an interesting read, to say the least. Also, good to know that Banitsa can be both sweet and salty – I am perhaps the only person who does not have a sweet tooth so the salty Banitsa sounds just about right. It does, doesn’t it? Probably you have heard of Bulgarian yoghurt – it’s very popular in Asia nowadays. 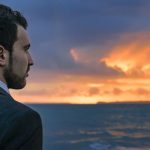 I have an article on that so feel free to check that out if you have not. 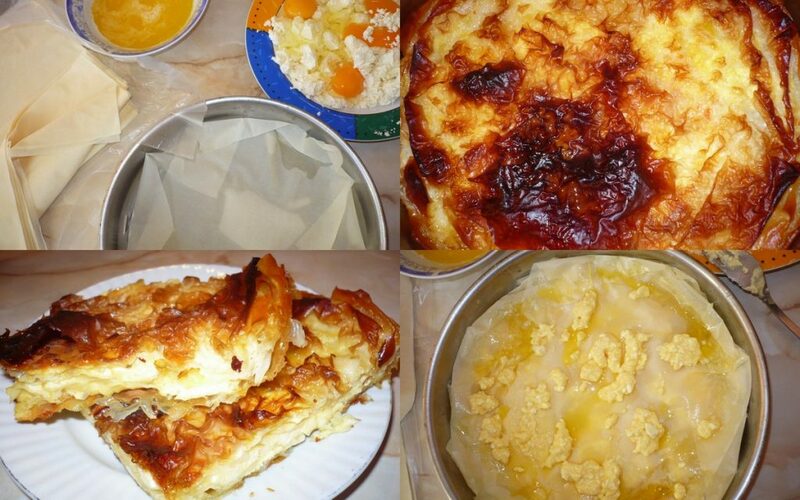 Banitsa traditionally is salty – with cheese and eggs – so you will definitely love it! I would never have known there are so many ways for this. The roses look the best to me. That is probably because I like cute food. Well, me neither, but when I started doing my research for this article, I found out there are so many. For instance, the roses are by a friend and it is the first time I saw something like that. I haven’t tried them yet, but I will make sure to do so. That looks so delicious. I try not to cook if I can help it, but I am going to see if i can find a Bulgarian bakery in NYC. It will have to do until I make it to Bulgaria, because I really want to try this!! I never knew that bulgarian cuisine could be so yum. These looks delicious. 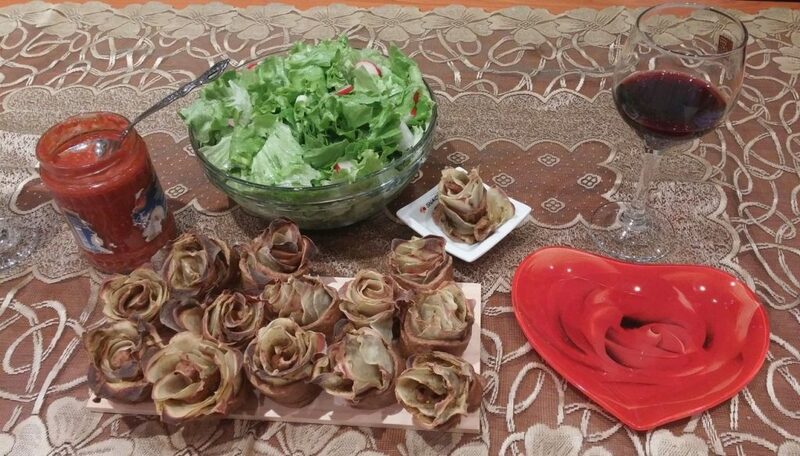 I loved the banitsa roses. Would love to try these someday. Oh, believe me, Bulgarian food is one of the best you have never tried! 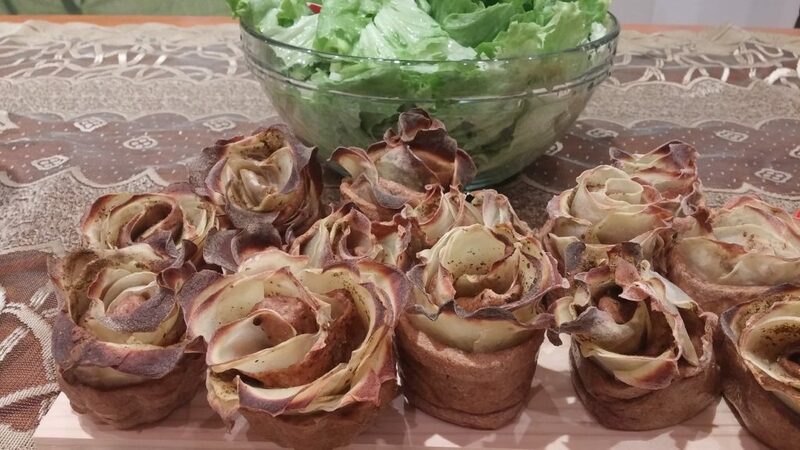 :)) The banitsa roses are quite cute, aren’t they? You would love tasting the real one, too!